A wire-free fire system utilises sophisticated secure, licence-free, radio communications to interconnect the sensors (smoke detectors, PIRs, etc.) with the controllers. A simple concept, but one that provides many unique benefits. 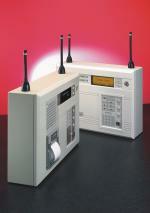 Our everyday lives have been changed by the use of radio communications, and now so has protecting life and property. Our extensive product range provides wire-free solutions for all types of installations including fully integrated networked systems. FirePoint is a full analogue addressable fire detection system with a set of features that make it one of the most advanced fire detection systems available - and without the need for cable.The system incorporates industry standard sensors and each device is battery powered with a typical 5 year life. 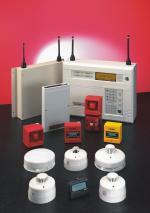 The devices communicate with the controllers using secure, fully compliant, dual frequency signalling. 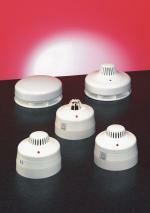 FirePoint Controllers are available in 4, 12, 24 and 96 zone versions. Meeting the requirements of BS5839 part 4 & EN54/2, each controller has an easy to read display and simple to use controls. All controllers can be fully networked either by radio or hard-wire. There are also a number of other ancillary products that complement fire systems, including Deafgard and Radio Door Close. Deafgard is an innovative wire-free fire alarm listening device which ensures that deaf and hard of hearing people can recognise a fire alarm at all times. Deafgard listens for the fire alarm, allowing people to sleep, rest or simply relax safely without the inconvenience of always having to wear their normal hearing aid. When an alarm occurs Deafgard's high-intensity flashing strobe provides a visual indicator and the under pillow pad vibrates to awaken guests. Radio Door Close is a simple, reliable acoustic device that holds a fire door open in any position and then automatically releases the door should a fire alarm sound. Inexpensive to buy, Radio Door Close is also quick and easy to install. It simply screw-fits to the bottom of the chosen fire door in a matter of minutes with no risk to the fire door’s integrity. The unit’s rubber plunger/stopper is in contact with the floor and, unlike magnetic retainers, can hold the door open in any selected position. When a fire alarm sounds, Radio door close’s integral audio-electronic device signals the plunger stopper to retract and releases the door to close. Radio door close is battery operated so there is no need for complex and expensive wiring.